Thats what i get when i told my parents about my mental and health issues.. about my trauma and depression..
Thats all.. i need to get over it by myself.. i don't need help.. i'm gonna be fine..
😊 what's the point i tell them about my problems.. when they don't even care?? Well.. am i really gonna be fine?with this trauma? Depression? And anxiety? I started to lose it..
Anxiety.. Bulimia... i can't afford it anymore..
Faking my smile.. faking my laugh.. faking everything…why? Why do i need to impress everyone.. I took a deep breath.. close my eyes for a moment.. i need to let it go.. i must! Tears slowly crawl down on my cheek.. I grab cutter that lie on my desk.. 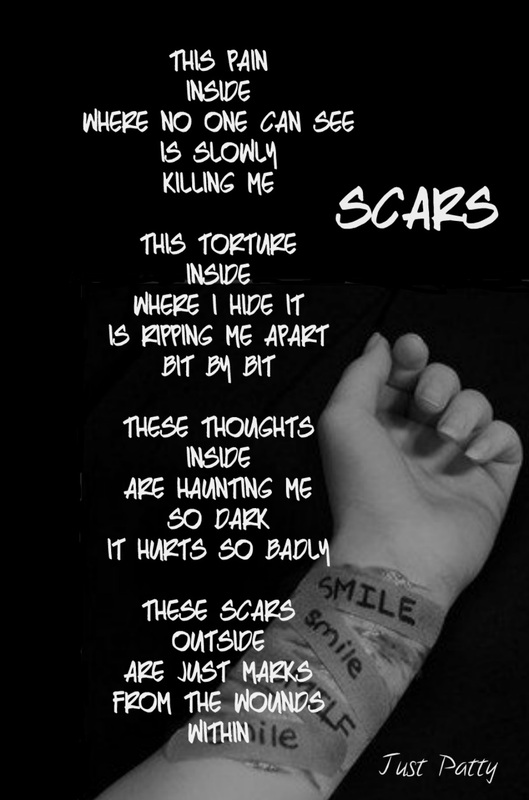 I drop the cutter.. i start to feel weak..
My tears cant stop falling.. I wake up from my bed… throw away my comforter.. face myself in front of the mirror… even though my wrist hurt.. blood shattered everywhere… i need to continue live on.. Yes.. i need to smile.. but then i felt something cold on my cheek… i'm crying. I hate to shed a tear… i totally hate it.. Suddenly i feel a vibration.. my phone ringing.. I see a notification come in..
Its from someone i know… i pick up my phone and start to read what written on the chat..
You know you are my everything.. before this i always alone... you're the one who support … help me whenever i down… i would do anything to always be with you… you know what.. you are my sunshine… you shine my day… when people shut me off.. you always there for me… "
"You are worthless than anything… don't hurt yourself… please don't…even no one in this world accept you for who you are... God still there for you.. i'm also always there for you… even its hard.. even its torturing you.. smile. Please smile.. your smile brighter my day.. i know you still there.. you didn't lose yourself.. you are here with us.. come back… we misses you so much….."
"But i know… you no longer here.. in this world.. with us… its been 3 month… we miss you a lot.. i.. i can't forgive myself.. for not be there while you hurting yourself... i know i'm not a good friend.. for always left you behind .. i'm sorry that i can't help you to break free from this cruel world… i'm so sorry…." " i miss you a lot…. I wish we still together… to the end… i'm sorry…. " My tears broken.. if only times can be rewind.. i wish i didn't do that stupid thing… i wish i was stronger than this.. I miss you guys too… a lot…. I'm sorry for doing all of this… i thought theres no one here for me anymore…. I look around my bedroom.. theres a photo on my cupboard… my photo… with a letter.. I feel like losing my ownself.. feel like wanna give up wanna end my life.. But i feel happy with my life now.. being alone are good and awesome.. i dont need to think about others.. their feelings.. are they okay or not.. coz they never even care.. about me.. so yeahh.. the hell with it..
😭😢 actually i do care.. i love all of my friends... but they didnt.. why should i have this kind of feeling.. i hate all of this..